Explants are small pieces of plant parts or tissues that are aseptically cut and used to initiate a culture in a nutrient medium. Explants can be taken from different parts of a plant such as shoots, leaves, stems, flowers, roots, and from many types of mature cells provided they are able to de-differentiate into totipotent cells. the plant species to be used. 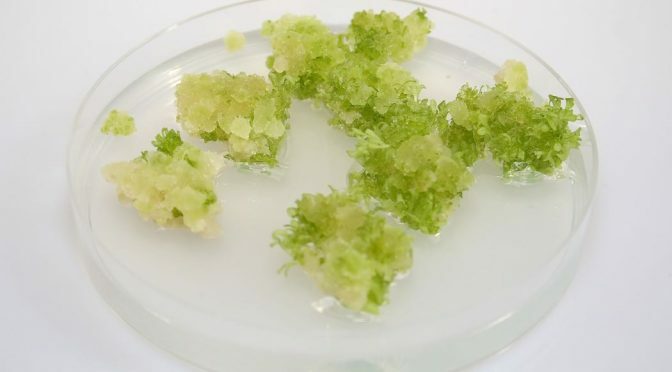 Also Read: What is Plant Tissue Culture? Large explants generally survive more frequently and grow more rapidly at the outset than very small ones. For successful culture initiation, there is a minimum size for explant per unit culture volume. In practice, the minimum inoculation size of explant varies according to the genotype of the plant being cultured and the cultural conditions. For commencing suspension cultures it is commonly about 1-1.5 x 104 cells/ml. Plants growing in the external environment are invariably contaminated with micro-organisms and pests. These contaminants are mainly confined to the outer surfaces of the plant, although, some microbes and viruses can even grow within the root. Also Read: What is meant by Cellular Totipotency? The microbes associated with explants generally overgrow the tissue culture medium before there is significant growth of plant tissue. Most of the surface microbes do not form tight associations with the plant tissue. They are easily removed from the explant by gently rinsing, and the remaining are killed by surface sterilization. Placing the explant in a 70% ethyl alcohol solution prior to treatment with another disinfectant solution. Conducting the sterilization process under vacuum. This results in the removal of air bubbles and provides a more efficient sterilization process. Also Read: What is Southern Blotting? How is it used to identify Specific DNA Sequences? Wikipedia, “Plant Tissue Culture”. N.p., 2016. Web. 3 Mar. 2016. Previous PostWhat is meant by Cellular Totipotency?Next PostWhat is Cell Theory?